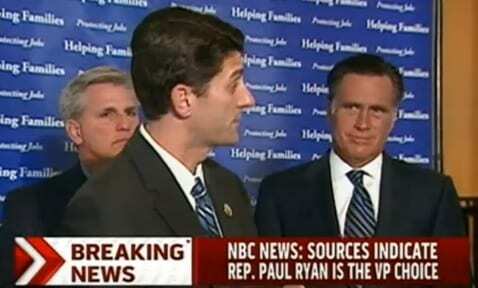 Mitt Romney has tapped Wisconsin Rep. Paul Ryan to be his running mate, The Associated Press reports. Some are calling the choice a “game changer.” Ryan is one of the most high-profile members of Congress. At just 42-years-old, Ryan has made a name for himself as the Republican budget guru. While the choice might be popular with the Tea Party and the base of the Republican party, Ryan is known as the person behind the Ryan “Kill Medicare” Budget. Even if he were to bring some votes in his home state of Wisconsin, his presence on the ticket will assuredly lose many votes among retirees in the swing state of Florida. Ryan’s presence will allow Romney to refocus his message on fiscal conservatism, cost cutting and deficit reduction. Democratic critics will see the choice as a sign that Romney has permanently moved politically right. The Ryan budget, which Romney has previously lauded, is emblematic of the GOP’s draconian plan of balancing the budget on the backs of the poor and middle class while lowering the tax rates of the wealthy. There is no word on whether Ryan will be giving up his Congressional campaign or if he will run both campaigns concurrently. Earlier speculation had been on Sen. Rob Portman (R-OH) and former Minnesota Governor Tim Pawlenty. Chris Christie’s name has come up as a dark-horse possibility. Romney’s eldest son, Tagg, apparently had the duty of notifying Portman and Pawlenty that they were not the choices. The official announcement from the Romney campaign is expected Saturday at 9:00 AM from Norfolk, VA. After the announcement, they will kickoff a bus tour of swing states, including Florida, Ohio and North Carolina. This entry was posted on August 11th 2012 at 8:52am/08:52 and is filed under Elections. You can follow any responses to this entry through the RSS 2.0 feed.